In gambling parlance, one could say Las Vegas is “on a roll” – which is defined as “experiencing a prolonged spell of success or good luck” – or simply put, it appears a promising winning streak is underway. Supported by a strengthening economy and increasing interest in Las Vegas, as both a major convention and tourist destination, other factors are in play as well and are expected to greatly impact Las Vegas in 2020. These include a number of big building projects, both underway and being planned, and having obtained major professional sports franchises. According to the Las Vegas Convention and Visitors Authority (LVCVA), the city welcomes over 42 million visitors annually and hosts over 22,000 meetings and conventions each year, and it has been rated the number one trade show destination for 24 consecutive years. However, these current numbers are expected to grow exponentially over the next few years – and here’s why. In terms of a destination-wide development snapshot, there are approximately $17 billion in projects currently under construction or planned and, if all currently announced projects come to fruition, approximately 15,400 hotel rooms will be added in the next few years. There are also approximately 3.8 million square feet of convention and meeting space projects currently under construction for Las Vegas, as well as a number of sports and entertainment venues – most of which will be completed and fully operating in 2020. In response to today’s increasing interest, and to remain the number one trade show destination in North America, the LVCVA recently announced the renovation and 1.4 million square foot expansion of the existing Las Vegas Convention Center that will bring over 600,000 new convention attendees to Las Vegas every year. Construction began with the $185.5 million purchase of the iconic Riviera Hotel property and its spectacular two-part demolition implosions in mid-2015. The expansion and renovation of the existing 3.2 million square foot facility will be done in three phases and when completed in 2023, the new facility complex will be known as the Las Vegas Convention Center District. Phase two is slated to be ready in 2020 and will again welcome one of the nation’s largest trade shows, CES 2021 with an anticipated 116,000-plus attendees expected. “With this project, our convention center will remain one of the world’s leading facilities,” said Lawrence Weekly, Chairman of the Las Vegas Convention and Visitors Authority and Clark County Commissioner. Caesars Entertainment group also recently broke ground on a new $375 million, 550,000 square foot Conference Center that will be located behind the Flamingo, Harrah’s and the LINQ. Many other properties are in the process of expanding their existing convention facilities as well, including the Wynn Las Vegas, Aria and MGM Grand. Along with all of the new meeting and convention space being created, there is great need for additional hotel rooms to house the hundreds of thousands of new attendees, along with new restaurants and spectacular new casinos and venues to keep them entertained. This being the case, much of the new major hotel construction activity is taking place on the once somewhat neglected North end of the Las Vegas Strip. Located on the site of the famed old Stardust Hotel and Casino and Boyd Gaming’s later Echelon project, Resorts World is the first ground-up, major casino resort development on the Las Vegas Strip in more than a decade. The 87-acre expansive $7 billion project now under construction features a modern Chinese theme, with 175,000-square feet of gaming space offering 3,500 slot machines and table games. 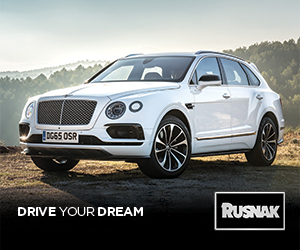 Initially, it will offer 3,500 hotel rooms and when fully completed, there will be four massive towers with more than 6,500 hotel rooms, looming above an array of luxury shops, elegant restaurants, elaborate gardens, an indoor water park and an aquarium – all designed to create a unique and luxurious international tourist destination and state-of-the-art casino/hotel experience. Located on Las Vegas Boulevard, diagonally across from Wynn’s Encore tower and just south of Circus Circus, it is within walking distance of the new and expanded Las Vegas Convention Center District and renown Fashion Show Mall. Resorts World Las Vegas is owned and operated by the Genting Group of Malaysia. Across Las Vegas Boulevard and not far from Resorts World, The Drew Las Vegas will be the beautifully finished multi-billion dollar version of the originally planned and abandoned Fontainebleau project. Located on the 25-acre site where the El Rancho and Algiers once stood, the imposing and impressive 60-story blue glass tower reigns the tallest building in Las Vegas, aside from the 110-story Stratosphere space needle. The Drew is the Strip’s first JW Marriott property and will feature nearly 4,000 rooms and suites, a casino, luxury shops, 20 restaurants, entertainment venues and over 500,000-square feet of convention and meeting space with a bridge connecting directly to the Las Vegas Convention Center. Two Blackbirds Hospitality will oversee operations along with Marriott International. The Drew is said to be named after Owner Steve Witkoff’s late son, Andrew. The Drew and Resorts World are only the start of bringing the once languishing North Vegas Strip back to life. The trendy SLS Las Vegas Hotel and Casino next door to The Drew recently announced new ownership and a $100 million renovation – and for those who appreciate and long for “old” Las Vegas – it is rumored the new name may once again be changed back to the iconic Sahara. Another new resort hotel and indoor arena has been announced too. Located in between The Drew and SLS Hotel and Casino, the $1.4 billion All-Net Resort and Arena Entertainment Complex, by businessman and former basketball player Jackie Robinson, is slated to be built on the 27-acre site of the long-closed Wet ‘n Wild Waterpark, thus elevating the North end of the Strip yet another notch. Additionally, it just may attract an NBA Basketball franchise to Las Vegas. Wynn Las Vegas also has two new projects on the drawing board – its 25-acre Lagoon Park to replace the existing golf course and another Wynn West hotel/casino similar to the Wynn Las Vegas and Encore just across the street – both about to be officially announced and scheduled for completion within the next 18- to 24-months. Wynn has also just opened its exclusive 70,000 square foot Wynn Plaza on the Strip featuring dozens of world famous high-end fashion retailers, upscale dining locations and luxury lifestyle options. Not all projects now underway are new construction. Many of the large hotel and casino organizations are also making major investments in both renovations and substantial upgrades for their properties. Station Casinos for example, has committed $620 million for a dazzling top-to-bottom renovation of the Palms Casino Resort and another $194 million to restyle its Palace Station property. 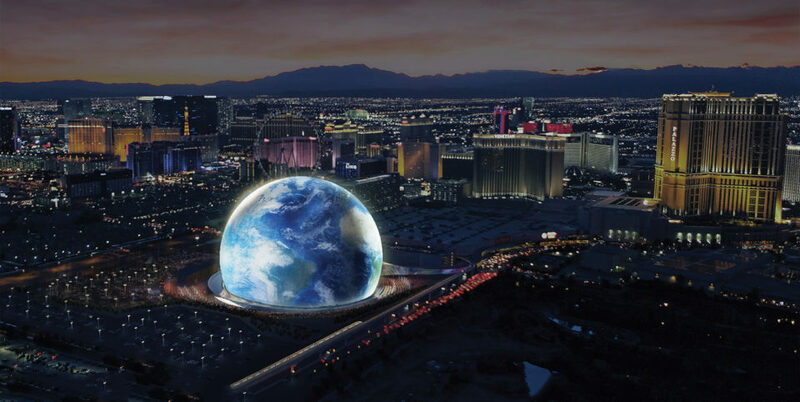 One of the most intriguing and interesting new projects is the MSG Sphere, by the Madison Square Garden Company. It is a one-of-a-kind huge globe, more than 360-feet high, created as an entertainment venue with a seating capacity of 18,000-plus. It is a hi-tech wonder both inside and out, with an LED all-around exterior that can be changed to anything imaginable and a 170,000-square foot screen inside that wraps around the interior and is billed as the largest LED screen on earth. Located on Sands Avenue, just off the Strip, the amazing new entertainment, meeting and concert venue will connect to the Venetian and Palazzo complex with a 1,100-foot bridge. The Strip as we know it, ends at the intersection of Las Vegas Blvd and Sahara Avenue and it is where the City of Las Vegas, the Arts District and the Downtown area begins. Joining the drive to refresh and renovate, both Fremont Street and the entire downtown area are also implementing efforts to bolster tourism. Just a block away and near the iconic Stratosphere tower, two new 26-foot tall showgirl gateway “welcome” signs were just unveiled and another welcome project with four huge arches that come together over the intersection of Las Vegas Blvd and Sahara avenue – supporting a “City of Las Vegas” script – has also been announced. 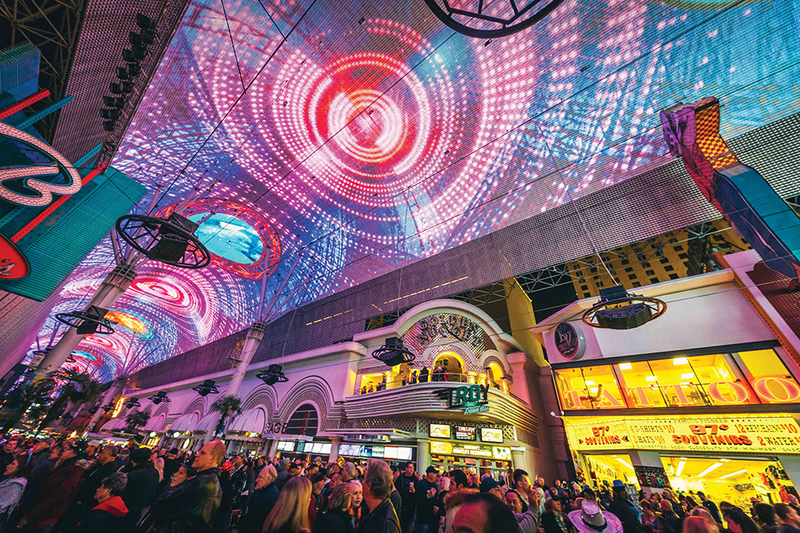 On historic Fremont Street, the spectacular four block/quarter mile long overhead LED video canopy is receiving a $32 million upgrade to make it seven times brighter and able to operate 24-hours a day. Billed as one of the largest video screens in the world, with 12.5 million LED lights and a concert-quality sound system, the new bigger and better light show will debut on New Year’s Eve 2019. Also on Fremont Street, a spectacular block-long (yet to be named) new resort hotel complex has just begun construction. “With the Fremont Street Experience attracting more than 23 million visitors a year, we’re really looking forward to seeing the new energy this brings to downtown Las Vegas,” said Patrick Hughes, President and Chief Executive Officer of the Fremont Street Experience. And, if all of that is not enough, Las Vegas is becoming a professional sports town as well. It began with the introduction of the Vegas Golden Knights hockey team that soared through its first NHL season and wound up vying for the coveted Stanley Cup. In tandem, it was announced the Raiders NFL football team is officially coming to Las Vegas and will kick-off in 2020 with a brand-new stadium. 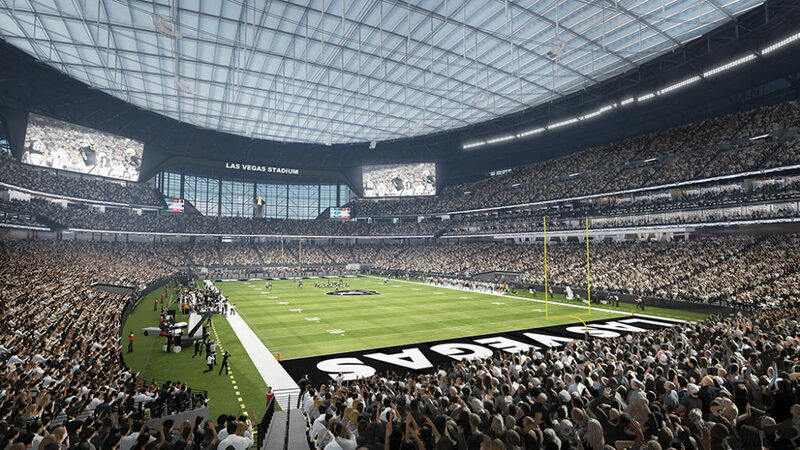 The only new major construction project located at the South end of the Strip is the $1.8 billion domed and air-conditioned Raiders Stadium. Now underway, it will seat 65,000 fans overlooking a natural grass field on a retractable tray that transitions to host other entertainment events, such as major concerts. Two 80-foot tall and 200-feet wide doors also open on one end for a view of the Las Vegas Strip Skyline. “This stadium will have a transformative effect upon the Las Vegas sports and entertainment scene,” said Clark County Commission Chairman Steve Sisolak, who represents the area where the stadium will be located just off the Las Vegas Strip. 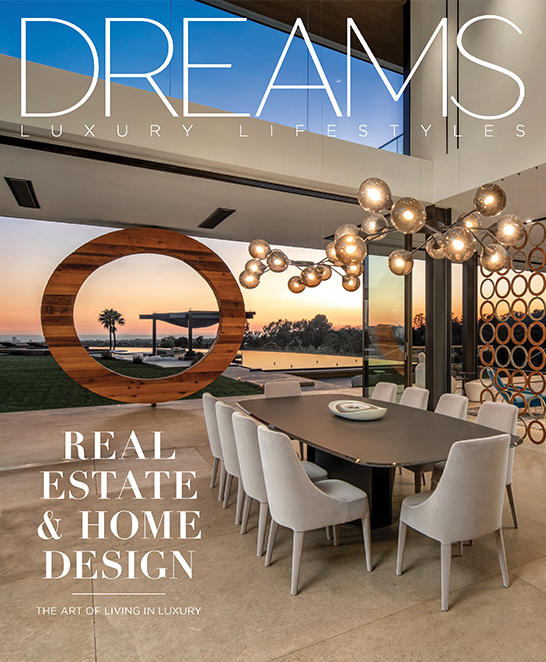 It has been decades since Las Vegas has seen such a convergence of new construction and multi-million-dollar renovations. Along with that, there is the exciting addition of professional sports teams, a new stadium and three big arenas for special events as well as a renewed emphasis on expanding the North end of the Strip and bolstering the gateway to Downtown and Fremont Street – where it all began. 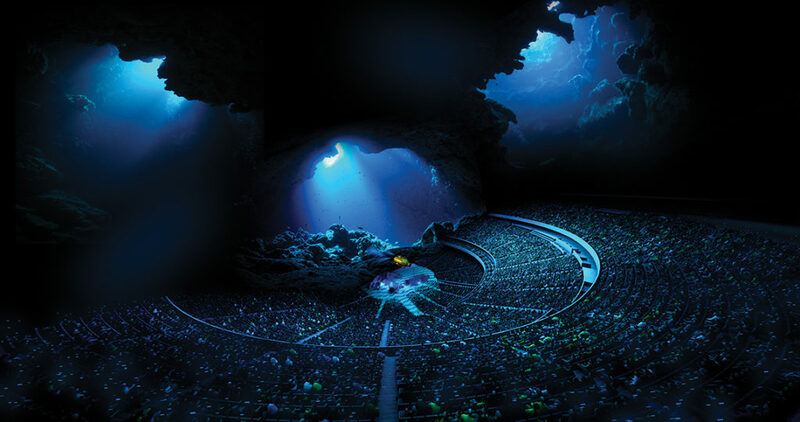 These projects – individually and collectively – are impressive, dramatic and certain to both further and enhance the lure and lore of one of the most iconic entertainment venues in the world. Yes, Las Vegas is “on a roll”… with an exciting winning streak and clear 2020 vision. Photos courtesy of Las Vegas Convention and Visitors Authority, Madison Square Garden Company, Raiders Media Relations and Fremont Street Experience.